Provide comfort for the family of Roger Smith with a meaningful gesture of sympathy. 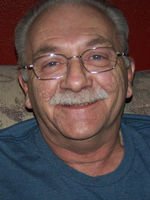 Roger A. Smith, 67, Independence, MO passed away April 13, 2019 surrounded by his loving family. A memorial visitation will be held 1:00 – 3:00 pm, Sat. April 20 at Carson-Speaks Chapel, 1501 W. Lexington Ave., Independence, MO 64052; cremation. Roger retired from the printing business after a forty-year career. He loved four-wheelers, dune buggys and mud trucks. Most of all he loved hanging out with this grandkids and great-grandkids. Roger was preceded in death by his parents Roger and Mary Smith; brother Kent Smith and daughter Jennifer Smith. He is survived by his wife of forty years Beckey Smith; son Chris Gant; grandchildren Shelby, Sabrina, Alexis, Tori and Kylee and seven great-grandchildren. To send flowers in memory of Roger Allen Smith, please visit our Heartfelt Sympathies Store. Consider providing a gift of comfort for the family of Roger Smith by sending flowers. Provide comfort for the family of Roger Allen Smith by sending flowers.